Here is the email exchange from June 2016 between Donald Trump Jr. and Rob Goldstone to provide the Trump campaign with incriminating information from Russia about Hillary Clinton and to arrange for Trump to meet with a "Russian government attorney." Below is the email exchange between Donald Trump Jr. and publicist Rob Goldstone that began on June 3, 2016, with Goldstone writing about an offer "to provide the Trump campaign with some official documents and information that would incriminate Hillary [Clinton] and her dealings with Russia and would be very useful to your father." 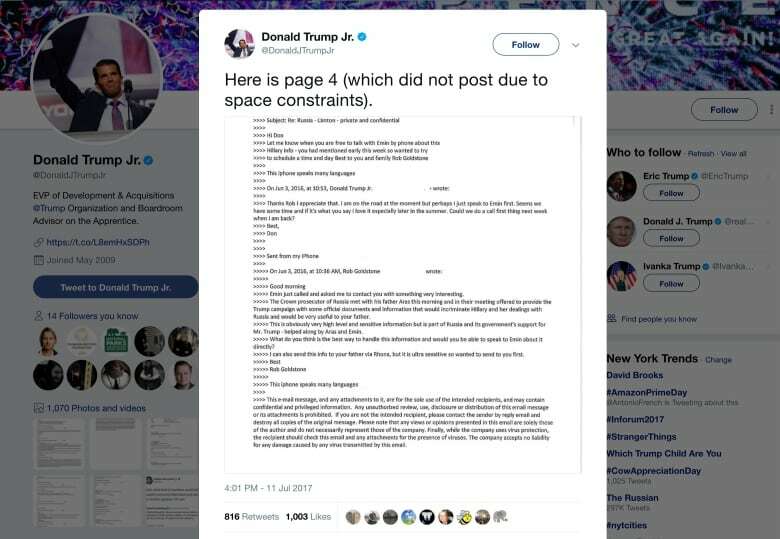 The text is as posted on Twitter by Trump Jr. with some of the header and signature information not included. The final email (No. 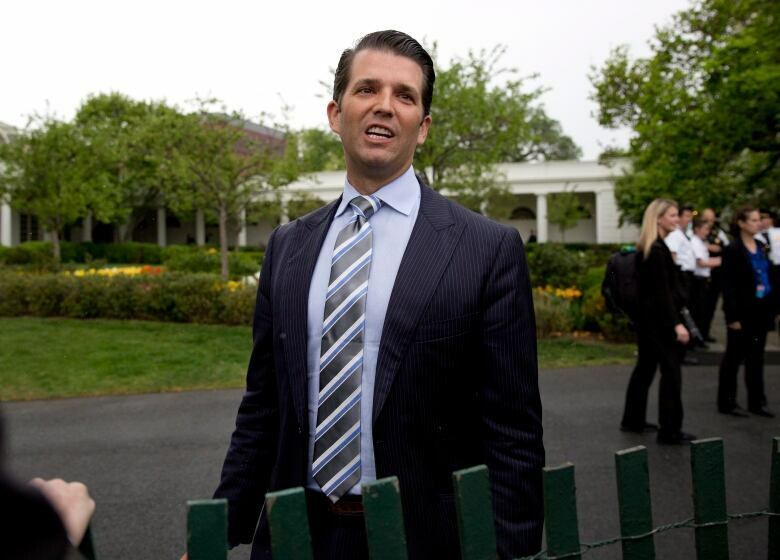 16 below) is from Trump Jr. to his brother-in-law, Jared Kushner, and Trump campaign director Paul Manafort about a June 9 meeting with Kremlin-linked lawyer Natalia Veselnitskaya. 1. Rob Goldstone to Donald Trump Jr.
Emin just called and asked me to contact you with something very interesting. The Crown prosecutor of Russia met with his father Aras this morning and in their meeting offered to provide the Trump campaign with some official documents and information that would incriminate Hillary and her dealings with Russia and would be very useful to your father. This is obviously very high level and sensitive information but is part of Russia and its government's support for Mr. Trump – helped along by Aras and Emin. What do you think is the best way to handle this information and would you be able to speak to Emin about it directly? Thanks Rob I appreciate that. I am on the road at the moment but perhaps I just speak to Emin first. Seems we have some time and if it's what you say I love it especially later in the summer. Could we do a call first thing next week when I am back? 3. Rob Goldstone to Donald Trump Jr. Sent: Monday, June 06, 2016, 12:40 p.m. Rob could we speak now? 5. Rob Goldstone to Donald Trump, Jr. Sent: Monday, June 06, 2016, 3:37 p.m.
What number he could call? 7. Rob Goldstone to Donald Trump Jr. Rob thanks for the help. 9. 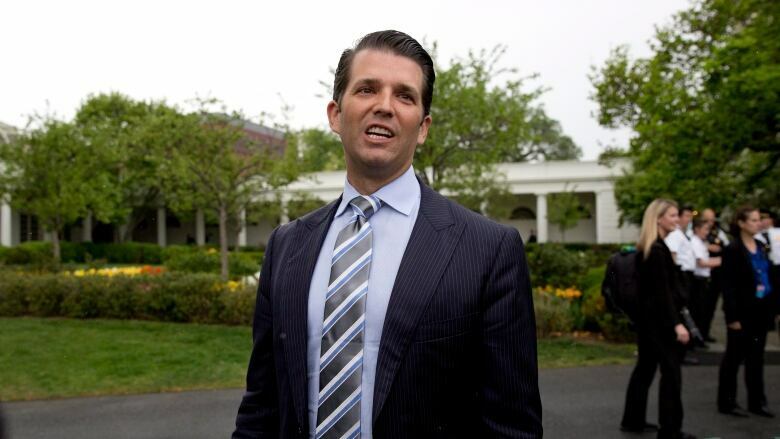 Rob Goldstone to Donald Trump Jr.
Emin asked that I schedule a meeting with you and The Russian government attorney who is flying over from Moscow for this Thursday. I believe you are aware of the meeting – and so wondered if 3 pm or later on Thursday works for you? I assume it would be at your office. How about 3 at our offices? Thanks rob appreciate you helping set it up. 11. Rob Goldstone to Donald Trump Jr. Perfect … I won't sit in on the meeting, but will bring them at 3 pm and introduce you etc. I will send the names of the two people meeting with you for security when I have them later today. Great. It will likely be Paul Manafort (campaign boss) my brother in law and me. 725 Fifth Ave 25th floor. 13. Rob Goldstone to Donald Trump, Jr. Sent: Wednesday, June 08, 2016 10:34 a.m.
Would it be possible to move tomorrow meeting to 4pm as the Russian attorney is in court until 3 i was just informed. Yes Rob I could do that unless they wanted to do 3 today instead… just let me know and ill lock it in either way. 15. Rob Goldstone to Donald Trump Jr. Sent: Wednesday, June 08, 2016 11:18 a.m. They can't do today as she hasn't landed yet from Moscow 4pm is great tomorrow. Sent: Wednesday, June 08, 2016 12:03 p.m.
Meeting got moved to 4 tomorrow at my offices.